555: Resolved a crashing bug that can occur when closing windows following a scrolling operation. 675: Resolved a bug that could cause the document tabs to disappear when there are multiple files open. 705: Addressed a Script Debugger 6.0.2 regression that could leave the user interface disabled. 562: A progress dialog appears while Script Debugger is code signing a script. This should avoid the temporary hang which sometimes occurs while code signing large or complex script documents. 702: Corrected a regression where the Explorer was incorrectly display both image and hex data for image values in Best view. 703: Corrected a regression where Script Debugger fails to recognize NSURL instances referring to a file and display them using the File Explorer. 704: To avoid codesigning errors, Script Debugger will strip resource forks/xattrs from all files in a bundle's /Contents/Resources folder before signing. Next story LogTail 2.7 – View and monitor local and remote log files. Previous story Templates for Numbers 4.6.1 – Spreadsheet templates for Apple Numbers. 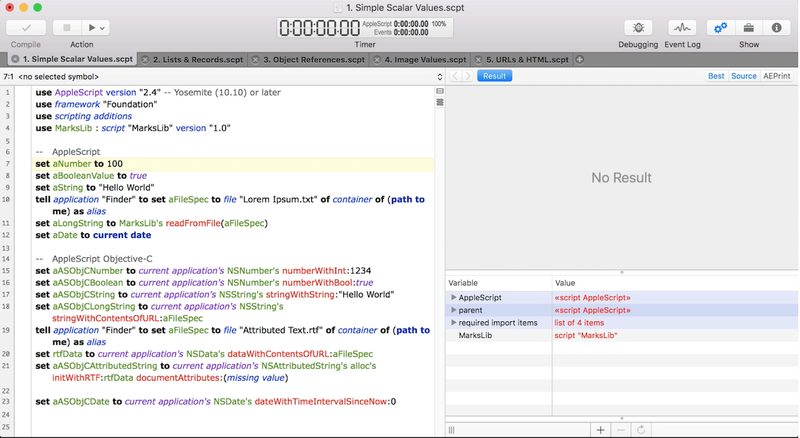 Script Debugger 5.0.11 – AppleScript authoring environment.